If the idea of discussing web code makes your eyes glaze over, it’s OK. We get it. You don’t have to learn to design and build websites in order to have an incredibly successful plumbing website for your business. But what it is important is that you lean on a web design firm who is laser-focused on creating a clean “back end” that can scale as you grow, and serve your company well in the search rankings. Did you catch that? The code matters for your Google search rankings. It’s not just about on-page content, which we’ll discuss in detail here shortly, too. But the actual programming, or “skeleton,” of your plumbing web design will be reviewed to determine how valuable your site is for potential customers using search engines. When search rankings can make or break your business (and they can), it’s critical to build a web design with expertise in coding and schema. What The Heck Is Schema and What Does It Have To Do With SEO? One aspect of web design for plumbers that is really important to implement well is schema. I’m not going to get too technical about it at this point because we have a lot of ground to cover when it comes to ideal user experience for web design. However, it’s worth mentioning because this is a key factor for securing those coveted top spots on the Google search results. Schema is a system of microdata or tags that are used when constructing a website. This secret code, so to speak, doesn’t translate to jargon on the page, impacting the user experience negatively. But rather it clues in Google and other search engines who have collaborated on the development of the schema vocabulary to what the site is about, how to display information about your company on various pages (such as search results list), etc. Using a set of parameters (or code) that search engines like is an obvious way to play nice and improve your search rankings. But it also helps improve the user experience for your plumbing web design. How? When your business shows up in a SERP (search engine results page), the user has more information available to quickly determine if you’re the company they want to call. In the first listing, you see customized metadata, which is good. But the second listing, which includes reviews and price range, is better! Given how quickly today’s home and business owners make decisions when it comes to vetting potential service companies, having this meaningful data at their fingertips means they’re far more inclined to reach out. This is a no-brainer, but as a consumer myself, I’m shocked how often I can’t for the life of me find a way to contact the company I’m researching. Your plumbing web design partners can manage this for you, ensuring that when a user lands on your Home Page (or any other web page), that your phone number is prominently placed. 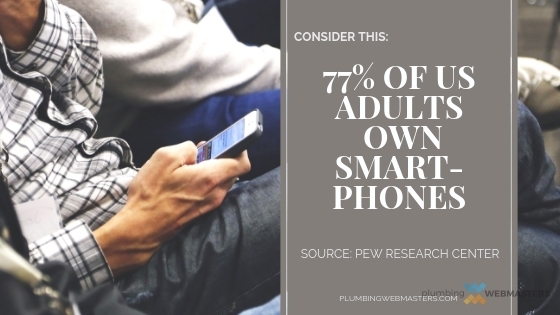 Also including a physical address, email address (or at least a link with the hidden address to avoid spam), and links to social media pages are so important for keeping potential customers engaged as they vet your company for their plumbing needs. As younger generations flood the workforce and start buying their first homes, there is a tremendous opportunity to forge new relationships with this ripe consumer base. But it’s vital that you understand how they are searching for home service providers, or for commercial plumbers as they fulfill their roles within a corporation or startup. This is a new breed of consumers, soaked in technology from birth, so dated techniques won’t work. You must pivot to meet them where they search. Given the rampant use of social media by this new generation of consumers, for everything from shopping and research to news and amusement, not showing up on Facebook, Instagram, and/or YouTube is a mistake. A big one. As you can see on the graph above, 88% of users between eighteen to twenty-nine-years-old are on social media. 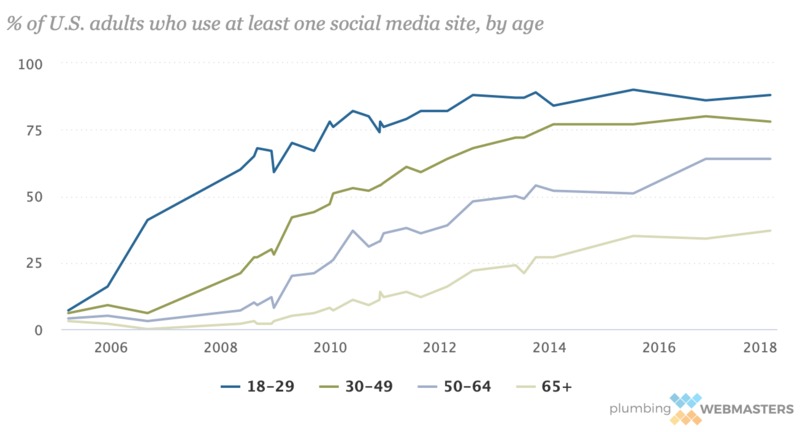 That may not surprise you, but don’t miss the fact that users thirty to forty-nine-years-old are also showing up in the social space; 78% of them, in fact. Don’t make the grave mistake of putting all of your proverbial eggs in the Google search basket, and missing out on the fact that embracing (or rejecting) social media platforms can impact your plumbing company in a massive way. And, yet again, social media impacts your search rankings, too. Google likes a cohesive web presence to legitimize a business, and social media accounts are a great way to provide consistent information to this end. One of the most positive aspects of the Google search algorithm (and the subsequent Quality Guidelines) is that websites are encouraged to provide value to the viewer in order to earn better search rankings. In other words, Google keeps good user experience at the forefront of their criteria for coveted top spots in SERPs, especially when it comes to content. I can recommend tips all day long to help your website perform better amongst plumbing companies in your area, but if you want to see long-term growth and success from your web design, there has to be a focus on deep, valuable on-page content. Words matter, and what you’re saying (or not saying) can make your investment dollar go much further when it comes to internet marketing. Since our focus is great user experience on your plumbing website, quality content is going to equate to industry-relevant information that is not overly technical (layman’s terms), but helps establish your authority and skill. Listing your services offered is great, but if you don’t flesh that out a bit, a list of bullet points isn’t going to serve you well. Every plumber is going to list out what they do, so the key is market differentiation. People love stories. We respond to context and meaning, so don’t underestimate how that can invite phone calls even when we’re talking about a busted pipe or backed-up toilet. Organic content — i.e. that which is written out, with proper grammar and web-friendly design — is what will make potential customers feel engaged. It’s how they learn about your company, and, if done well, plumbing services that are relevant to them. This is an opportunity to give away some of your expertise in exchange for establishing the trust of new clients…because you’ve added value and understanding for something they need/want. It’s a win-win! Are you surprised to hear that what your customers want is what Google wants? It’s a point worth abusing. Paid approaches, such as PPC or PPL, may provide acute results, but if you want to play the long game (and you should), put great organic content out there on every page of your web design. This will be indexed and continue to garner traffic and attention long after you’ve taken the time (or paid the resource) to write it. Also, studies show that modern users (those social media mavens I mentioned before) are clued in to paid ads cluttering the top spots of SERPs, and will scroll to look for the organic top-rankers. We love our smartphones. And it’s not just “young folks.” Pew Research Center reports that 77% of American adults own a smartphone. This means that these mini computers are significantly impacting how people live (on-the-go), and, naturally, how they shop and search for service providers. Creating a web design that is mobile is vital so you don’t miss out on the opportunity to capture these plumbing leads. Having a website is great, but having a distinct, optimized mobile website is vital. The screens of our smartphones, though growing over time, are still significantly smaller than those on our laptops or desktop computers. Orientation, image size, and even the navigation must be honed for these devices in order for the user experience to be as strong on an iPhone as it is on a tablet or laptop. Don’t lose steam on your internet marketing progress because you overlooked this separate but vital aspect of web design for plumbing services! One of the biggest factors when it comes to mobile site performance is speed. We expect our information quickly these days, with an incredible breadth of data available to us in a matter of seconds, no matter where we are. You can perform a simple load speed test for your website on a mobile device using Test My Site. If it takes more than a few seconds, you’re dead in the water. The current digital climate is that cut-throat. Quality content won’t do you much good if potential customers won’t stick around long enough to find your phone number on your website (which, as we discussed earlier, had better be quickly accessible). Photos are a great way to add warmth and personality to your plumbing web design. There is a barrage of stock photos available, but those images are often used with reckless abandon, which means they’re not going to set your website apart. In fact, potential clients will be incredibly turned off if they see the same image used by multiple vendors. These plumbers will seem hokey and unoriginal, neither of which encourages a service call. Unique photos, optimized for the medium (think laptop or smartphone, as we just discussed), will appeal to users who want a better sense of who you are, who are your technicians, what kind of work do you do, etc. There is value and perspective implicit in the images you present, all of which contribute to a distinct brand. The user experience is enhanced when we see real faces, connecting us to your unique plumbing offerings. Don’t feel like you have to overcomplicate this aspect of user experience web design to do it well. Professional photographers can help you build a library of images to use across your web pages (don’t forget to include social media to reach those younger clients! ), and this is a great tool for establishing a cohesive brand. But there is also tremendous value in snaps taken from your smartphone of one of your plumbers on the job, or a capture of a job you recently completed that demonstrates your awesome plumbing repairs. How Can I Ensure My Website Provides a Great User Experience? Simple. When considering user experience, put yourself in the shoes of your potential client. Or better yet, the next time you need a service provider (for a broken down air conditioner or to rid your home of pesky pests, for example), consider this a ripe opportunity to consider what you like and dislike as your search. The user experience is what is ultimately either intuitive or disruptive in easily locating a professional to call. As we’ve established, the search engines are aligned with what people want from their online quest. So consider what serves you best as you put the shoe on the other foot, and make sure you’re offering that to your potential clients with your plumbing web design.